An IED can be almost anything with any type of material and initiator. It is a "homemade" device that is designed to cause death or injury by using explosives alone or in combination with toxic chemicals, biological toxins, or radiological material. IEDs can be produced in varying sizes, functioning methods, containers, and delivery methods. 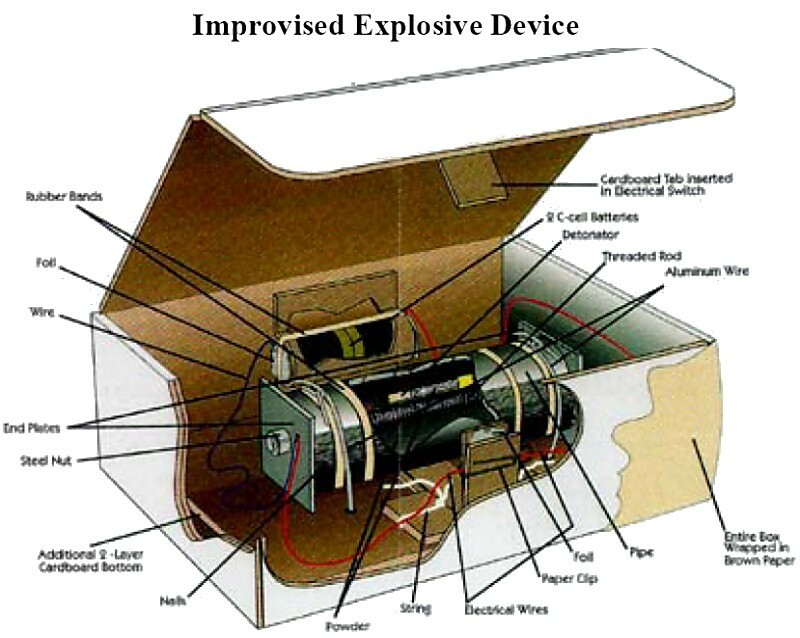 IEDs can utilize commercial or military explosives, homemade explosives, or military ordnance and ordnance components. They are unique in nature because the IED builder has had to improvise with the materials at hand. Designed to defeat a specific target or type of target, they generally become more difficult to detect and protect against as they become more sophisticated. Rolling. The roller will pass over the initial, unfuzed device and set off the second fuzed device. This in turn detonates the overpassed device underneath the clearing vehicle. When the linked devices are directional fragmentation mines, they can create a large, lethal engagement area. Boosting. Buried mines, UXOs, or other explosive devices are stacked on top of one another. The device buried deepest from the surface is fuzed. Fuzing only the deepest ordnance helps mask no- and low-metal explosive hazards placed near the surface. This reduces the probability of detection by metal detectors, and it increases the force of the blast. Sensitizing antitank (AT) mines. On some nonmetallic AT mines, the pressure plate is cracked and the spring is removed to reduce the pressure required to initiate the mine. Similarly, the pressure plate can be removed from metallic AT mines to create the same effect. A pressurefuzed AP mine can be placed on the top of an AT mine, thus creating a very large AP mine as an alternative method. Daisy chaining. AP mines may be used in daisy chains linked with other explosive hazards. Enemy forces may link the mines together with trip wire or detonating cord. When the initial mine is detonated, the other mines may detonate. This may also create large, lethal engagement areas. Booby traps and IEDs are similar to mines in that they are designed to kill or incapacitate personnel. They are also emplaced to avoid detection and improve effectiveness. Most are victim-activated, but some may involve remote or command detonation architectures. The use of booby traps is limited only by the imagination of the adversary. Booby traps are victim-activated devices intended to create casualties and terror and may or may not be found in areas of tactical significance. Are usually explosive in nature. Are usually activated when an unsuspecting person disturbs an apparently harmless object performs a presumably safe act; for example, souvenir hunting. Are designed to kill or incapacitate. Cause unexpected random casualties and damage. Create an attitude of uncertainty and suspicion, in effect lowering morale and inducing a degree of caution that restricts or slows movement. Assume that all mines are booby-trapped. Hand grenade with pin pulled, placed in a small glass with glass filled mortar or plastic of paris. 120-mm HE mortar with hole drilled in shipping cap with an electric blasting cap inserted (placed in a sandbag). Suicide vest-leather-look sleeveless waistcoat with explosives and ball bearing sewn into the interior. A hand grenade thrown into a building or dropped from a bridge. A rocket-propelled grenade (RPG) fired at a vehicle from the manufactured launcher. An RPG fired from an improvised launcher (while the launcher is improvised, the round was fired as intended without modification). A landmine placed in the roadway using the manufactured fuze to initiate it as designed. A study of the Soviet/Afghan war has proven extremely useful in addressing medical issues associated with mine strikes. Throughout the course of that war, 30 to 40 percent of trauma cases treated by Soviet medical personnel were caused by mine strikes. Necessarily, the Soviets adopted measures to improve force protection, gained a greater understanding of the effects of a mine strike on the body, improved casualty evacuation techniques, and implemented measures to plan for medical contingencies at the lowest level. Training (refresher) in first aid. Sandbagging the vehicle floors using fine aggregates because large particles become missiles. Riding on top of armored vehicles when the tactical situation permits. Leaving vehicle hatches cracked with the latch pin in place to permit dispersion of the concussive effects of a mine blast. Disseminating information through intelligence channels and/or the mine information coordination cell. Injuries sustained during a mine strike are caused by the pressure wave of the primary blast, the penetrating and nonpenetrating wounds of the secondary blast, and the injuries associated with being thrown some distance. The combat medic or lifesaver must be aware of multiple wounds and combination wounds that usually result from a mine strike and must know how to thoroughly treat the patient. Additionally, treatment of shock becomes important, especially since 86.5 percent of Soviet mine strike victims went into shock. Fifteen percent of shock cases were irreversible, and the victim died in a short period of time.